The Renoir painting Woman of Algiers' lack of energy and perhaps related voluptuousness ( idle hands are the devil's playground etc. ) is obvious from the painting as we can see for ourselves .Just look at her face ! She is clearly thinking about something a little more exciting than her income tax. SPECIAL NOTE : The painter will make the reproduction as close to the original oil painting as possible. 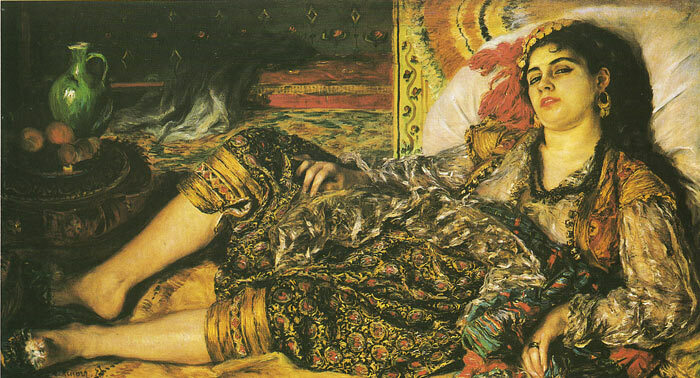 If you want your painting to alter from this likeness, please email us and " Woman of Algiers, 1870 " will be reproduced according to your special requirements.